Welcome to the University of Wisconsin Master of Science in Data Science Blog! Hello, aspiring data scientist! Welcome to our blog. Here, you will find news, information, and resources focused on the amazing world of big data and data analytics—two ideas that are fast becoming keys to success in the 21st century. If you are reading this, you have some interest in the field. Maybe you are looking to start a new career in data science, or you would like to take your current career to the next level with new skills and a new credential. 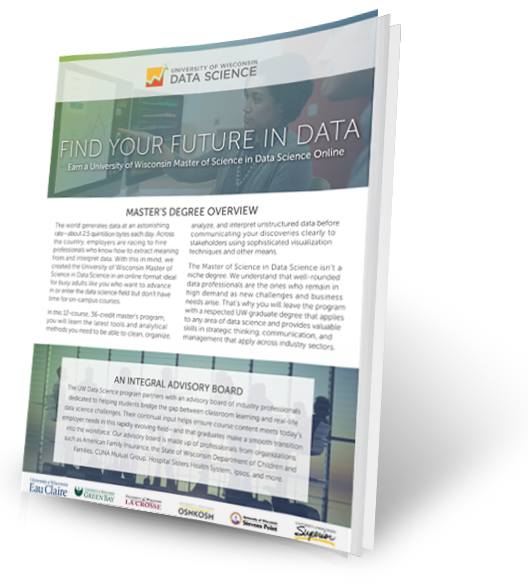 Whatever your interest, data science is a goldmine of opportunity—for you and your prospective employers. Companies and organizations that find and hire the talent to uncover the secrets hidden within their data will be the ones to drive innovation, overcome challenges, and gain competitive advantage. Luckily for you, such professionals are in short supply. Now is a great time to earn a master’s in data science. Your knowledge and skills will be in great demand. Make yourself at home. We invite you to comment, share our posts with people you know, and stop back often to see what’s new. This blog will be a growing and evolving resource, so please do write to tell us what you think and what kinds of topics you’d like us to cover. Let’s have some fun together as we explore the world of big data and data science! P.S. Want to receive new blog posts by email? Sign up using the link at right.